VA Form 21-4182 is a United States Department of Veterans Affairs form also known as the "Application For Dependency And Indemnity Compensation Or Death Pension (including Accrued Benefits And Death Compensation Where Applicable) From The Department Of Veterans Affairs". 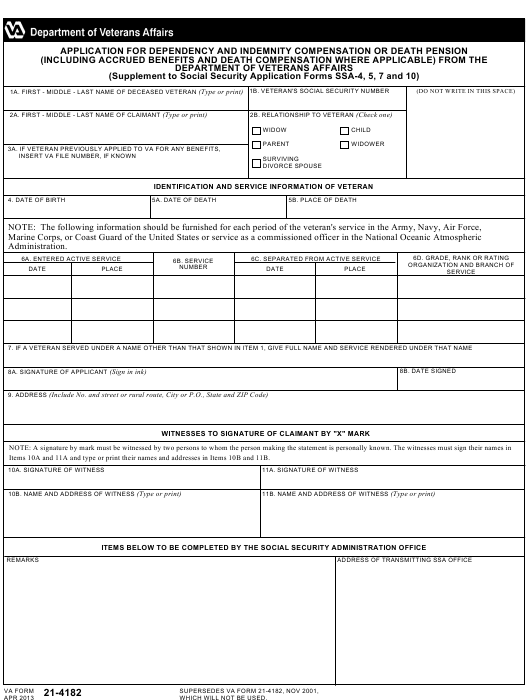 The latest fillable PDF version of the VA 21-4182 was issued on April 1, 2013 and can be downloaded down below or found on the Veterans Affairs Forms website. Items 10A and 11A and type or print their names and addresses in Items 10B and 11B.